(MENAFN - WPR) Held under the patronage of His Excellency Sheikh Nahayan Mabarak Al Nahayan, UAE Minister of State for Tolerance, The University of Manchester today held its sixth MBA graduation ceremony for Middle East students of the University’s business school. 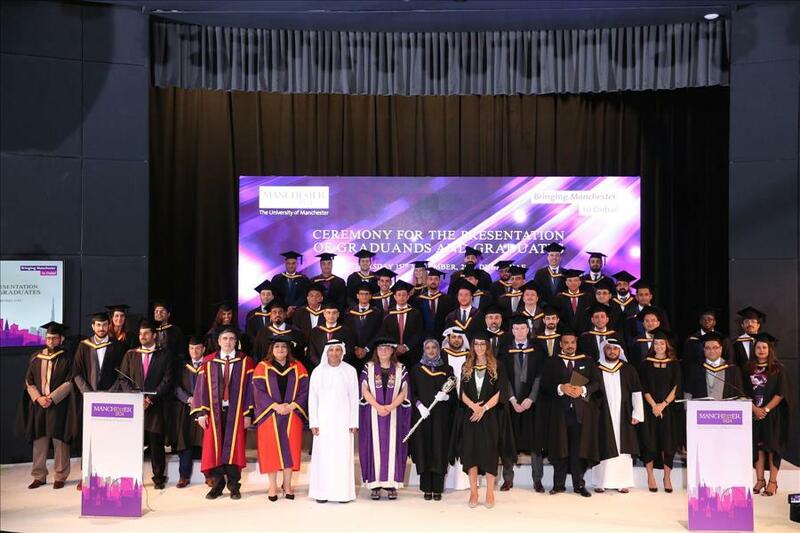 The ceremony, held at the Dubai Knowledge Park conference centre auditorium, marked the graduation for 46 students, who were awarded the University of Manchester MBA degree at the only graduation conducted by the University outside the UK, attended by family and friends. Of the new graduates, 34 students graduated with Merit or Distinction. The students of the graduating class reside in six countries (out of 60 countries of residence represented by students & alumni of the Middle East Centre) across the GCC & MENA region and are of 15 nationalities (out of 100 nationalities represented by students & alumni of the Middle East Centre); around three-quarters of the graduates reside in the UAE. Around 10% of the new graduates are female. The Middle East centre graduated a total of over 160 MBA students in the year 2018. The Presiding Officer at the graduation ceremony was Professor Sharon Clarke, Deputy Dean of Alliance Manchester Business School, part of The University of Manchester, and the ceremony was conducted in the presence of Dr Abdulla Al Karam, Chairman of the Board of Directors and Director General of the Knowledge & Human Development Authority (KHDA), who also addressed the congregation. The University of Manchester opened its Middle East Centre at Dubai Knowledge Park in 2006 and, today, it is the largest and fastest growing of the University’s network of six centres around the world. The Middle East Centre has supported more than 2,300 part-time students in the region, and graduated more than 1,400. In the Middle East, The University of Manchester offers the two-year Manchester Global Part-time MBA programme for experienced working professionals, new industry-led business Masters degrees in International Healthcare Leadership and Reliability Engineering & Asset management, and a growing portfolio of executive education short courses. and MSc International Healthcare Leadership. The Centre works in regional collaborations with a range of industry groups, professional bodies and companies, and supports a regional alumni association with more than 2,500 members.